Posted 9:30 am by Joanne Tan & filed under Be Inspired!. Image credit: 82955120@N05. “Being an entrepreneur is simply going from one mistake to the next. You must have the fortitude to continue on.” – Robert Kiyosaki Robert Kiyosaki is an American investor, businessman, self-help author, motivational speaker, financial literacy activist, and occasional financial commentator. Click here to see more of Robert Kiyosaki’s quote. Image credit: 4961717384. 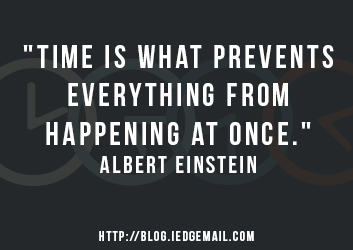 “Time is what prevents everything from happening at once.” – Albert Einstein Albert Einstein was a German-born theoretical physicist who developed the general theory of relativity, effecting a revolution in physics. Check out Albert Einstein’s tag for more of his quotes! Image credit: bevgoodwin. “Marketing is a contest for people’s attention.” – Seth Godin Seth Godin is an American author, entrepreneur, marketer, and public speaker. Click here to see more of Seth Godin’s quotes.